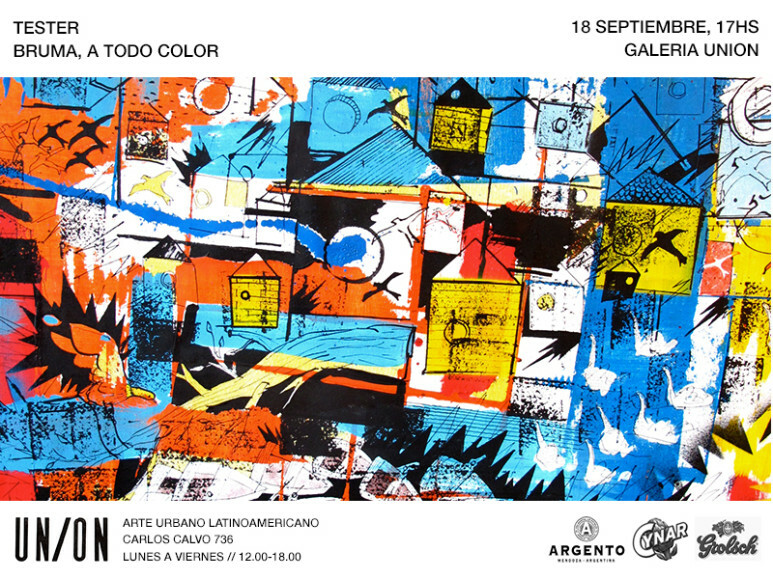 Everyone’s invited to the opening of the new show at Galeria UNION on Thursday 18 September. ‘Bruma, a Todo Color’ is a solo exhibition from the extremely talented artist Tester. Tester’s work crosses the line between the figurative and the abstract. The fear of emptiness and emptiness itself coexist in compositions created around abstract and popular phrases, stamps and lettersets combined with hand-drawn forms. Heavily influenced by the DIY attitude of the local punk rock scene, Tester creates elaborate works using analogue techniques, and incorporates spray-paint, ink and acrylic paint into works which suggest an ordered form of chaos. “Bruma a Todo Color” brings together 20 works on canvas and wood, from small to large format. “Bruma, a Todo Color” obscures in order to reveal, taking us away from the familiar and directing us to the wanderings of our own imagination. The interpretation of Tester’s work is a continuous process, and the search for meaning within the chaos of his paintings completes the work whilst ensuring an enduring appreciation. Mariano Tester Alonso is part of the collective Rundontwalk, the Hollywood in Cambodia gallery and the Club Albarellos gallery. A self-taught artist, his career began in the late 1990’s within the local music scene, after which he took his art to the streets before moving indoors to art galleries. Galería UNION is an art gallery and project space in San Telmo. The space brings together artwork of South American artists in a celebration of contemporary and urban art. UNION is run by the graffitimundo team.